Let's jump ahead shall we? Following the discovery that the Rebel pilot responsible for the destruction of the Death Star is his own son, Darth Vader returns to Tatooine, bringing archaeologist Doctor Alphra with him to investigate the ruins of the Lars homestead and the home of his old mentor Obi-Wan Kenobi. Finishing up there, the two split up with Vader returning to his duties, mainly handling unwanted competition for the Empire's new ally Jabba the Hutt. Meanwhile Alphra brings together a group of bounty hunters for a get rich quick scheme that just happens to involve an Imperial transport and a confiscated fortune. 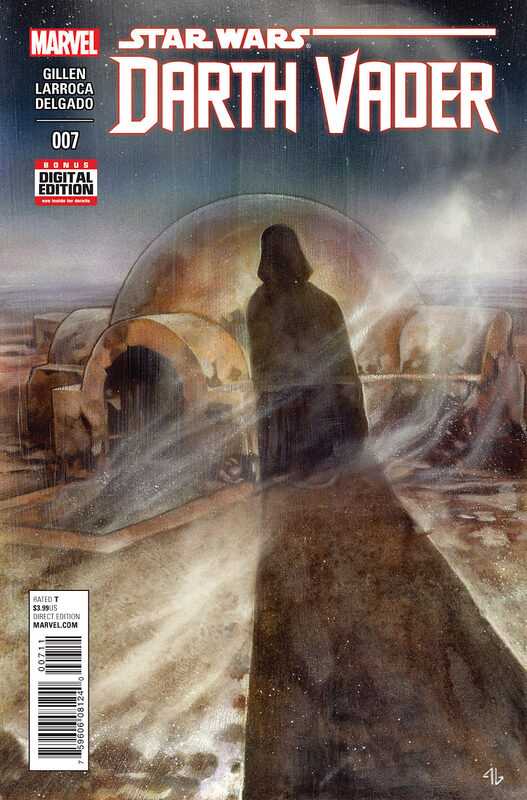 Moving from issue 2 to 7 I know I'm missing a lot of back story here (not to mention some cross over with the main Star Wars comic series) but again there is enough here to make it easy to come in and not feel confused. Like the first two issues writer Kieron Gillen's strongest suit is his way with Vader, showing us a cold person (more machine than man if you like) now dealing with betrayal and the revelation that his son is alive and working with the Rebels. That overcomes the repetitive events of the rest of his story, from another Imperial raid on the criminal underworld (which was in no. 2) to more bounty hunters, even though fans will enjoy the cameos. Helping immensely is the artwork by Salvador Larroca, which again captures the characters and universe wonderfully. From the recognizable images of Vader, the homestead and even Bossk and the IG droid designs, this is clearly from the same universe, handled with skill and attention to detail that sometimes have gotten lost in past comics. So fans of this series again will find much here to enjoy while waiting for December. Have fun and a safe weekend and until next time, the Force will be with you. 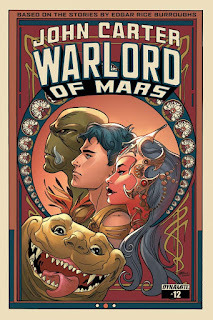 John Carter: "Mars or Bust"
'John Carter-The Role Playing Game' Coming! 'Doctor Who' Season 9 Trailer Delivers!